This bathroom was originally two even tinier spaces in the upstairs of our 1939 stone cottage, with an old jacuzzi tub and tiny sink in one dormer room, and a toilet and another sink in a sliver of a space under the sloping eaves of the roofline.
. . . and a toilet and sink in the next room. So strange, I know. and d) use a deadspace under an eave for the toilet to fit into. Ends up the trickiest part of this whole thing was finding a way to fish those wires into some other hole and down two floors into the basement so that we could put the toilet waste line in that hole. It was a Christmas miracle, I tell you. Here’s the floor where a sink in one room backed up to a toilet in the other room. Guess what the contractor found in the space between these pipes? Go for the GOLD fixtures. 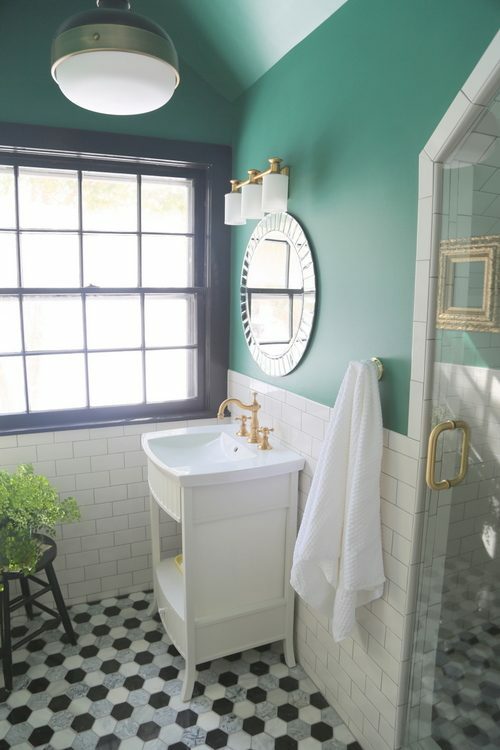 I had my heart set on bold gold fixtures, and I found my heart’s desire in the sink faucet, light fixtures, and even the hinges on the shower door. This is not your 1980’s brass, my dears! 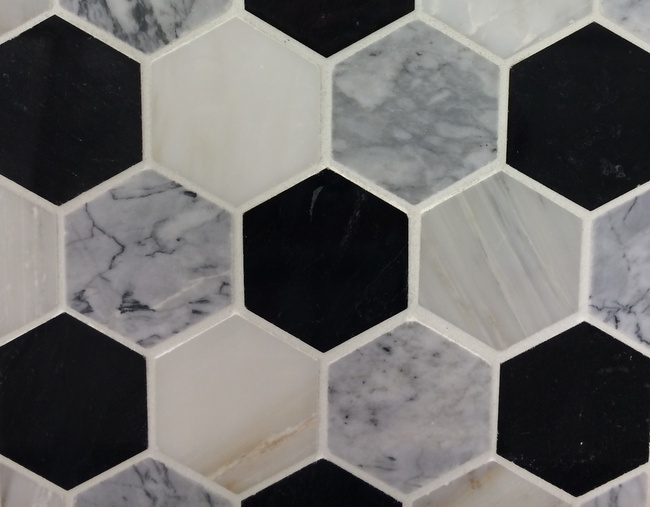 Keep your tile choices timeless. 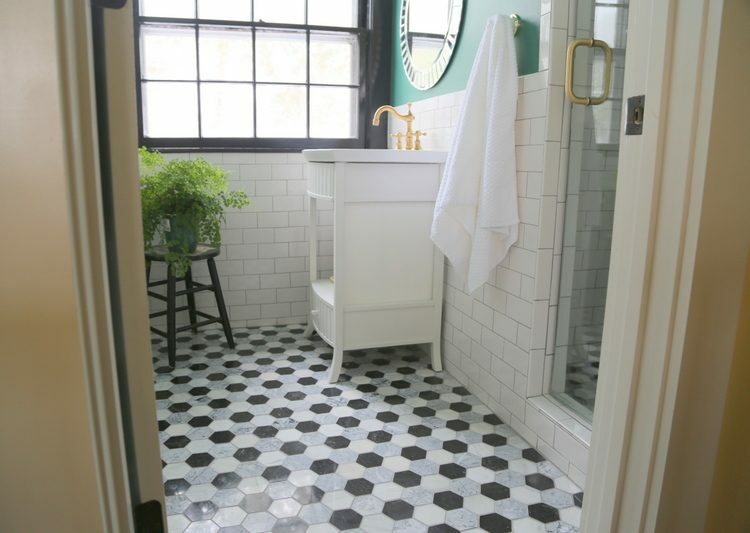 Classic subway tile on the walls and small hex tiles on the floor will never go out of style. We took the same floor tile right into the shower so as to keep the flooring material as unbroken as possible. That, and the smaller tiles give the impression of a larger space. I have heard many designers say, “going bigger on the floor tile makes a small bathroom appear larger.” That, my friends, is NONSENSE. When I see a bathroom with only three 18-inch tiles across its width, it only points out the fact that the room is so tiny that only three tiles can fit! Add a dose of black for sophisticated drama. 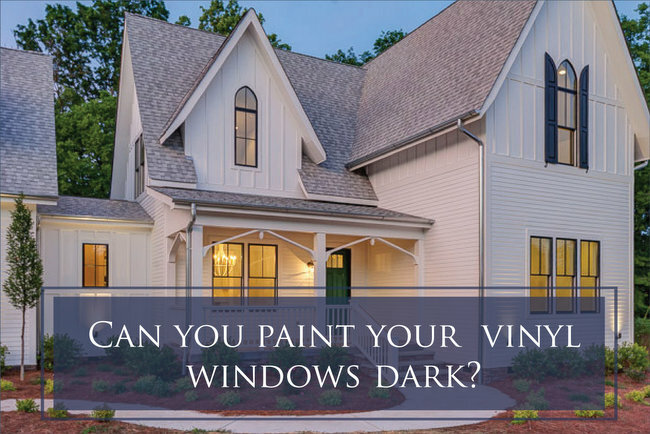 From the beginning, I knew I wanted to paint this window and its surrounding trim black. The black in the floor tile, in the door hardware, and on the hanging light fixture give this bathroom gravitas. I fell hard for the floor tile, which was $14.99 a square foot. A lot to swallow, but much easier so when paired with $.22 subway tiles for the walls. The affordable sink and vanity came as a set, and I don’t even miss having a stone countertop. The light fixture over the sink was a bargain at $150, and the hanging light fixture was less than $300. The splurge was the sink faucet, which was (cough, cough) close to $900. Long story – you can get the gory details here. I opted for the cheaper Delta fixtures in champagne bronze for inside the shower. They aren’t as gold as the other finishes, but since it’s darker in the shower you can’t really tell. 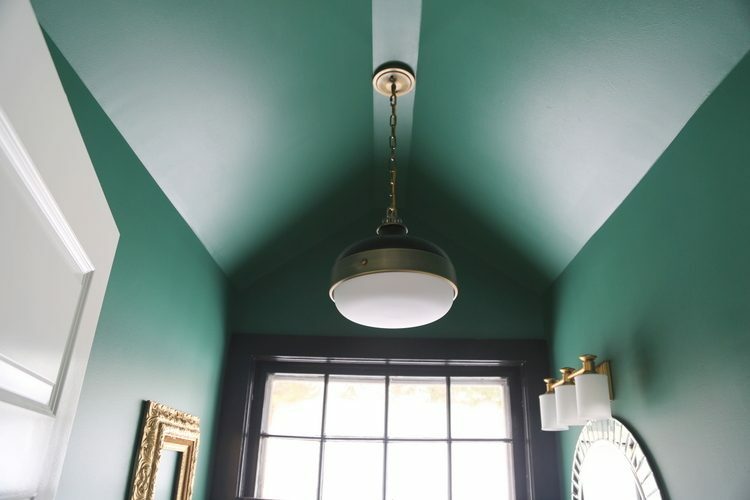 Wrap the walls and ceiling in a COLOR you love. 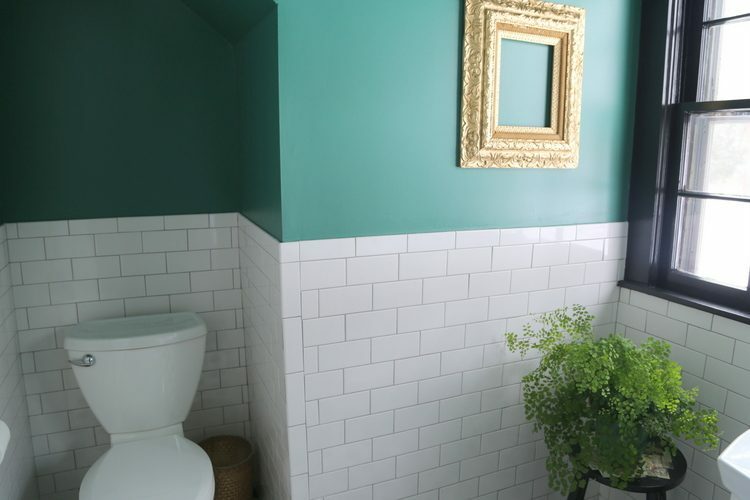 I’ve been wanting to use this emerald green paint color for some time now, and this was the perfect spot to go for it. 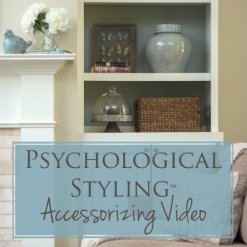 Don’t just stop at the walls if you don’t have crown molding in the room. 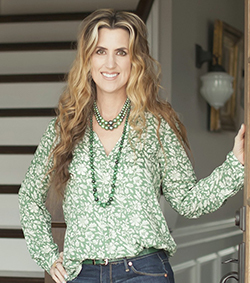 I also wrapped Benjamin Moore Steamed Spinach 643 onto the sloped dormer ceiling. Use towel hooks instead of towel bars. Towel bars take up a lot of room and few people hang up their damp towels neatly on them. That’s why I prefer hooks for towels. I used two prong hooks beside the shower and on the back of the door. All you have to do is pop your towel on the hook – no folding skills required! I found the round mirror at HomeGoods for $39. It’s small, but the mirror frame maximizes its reflective quality. 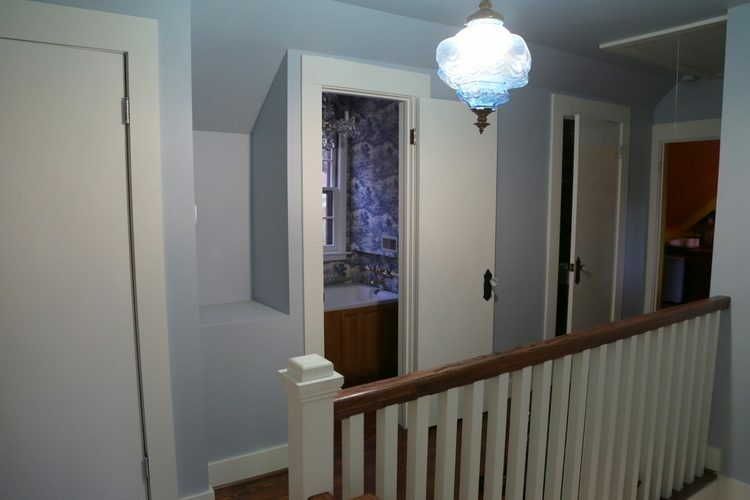 Here’s a shot towards the toilet, so you can see how that fits in a niche behind the door. I still have art to hang, but I couldn’t resist showing you the bathroom now! I hope you enjoyed the transformation, I know we certainly are! What's Black, White, Gold and Green All Over? 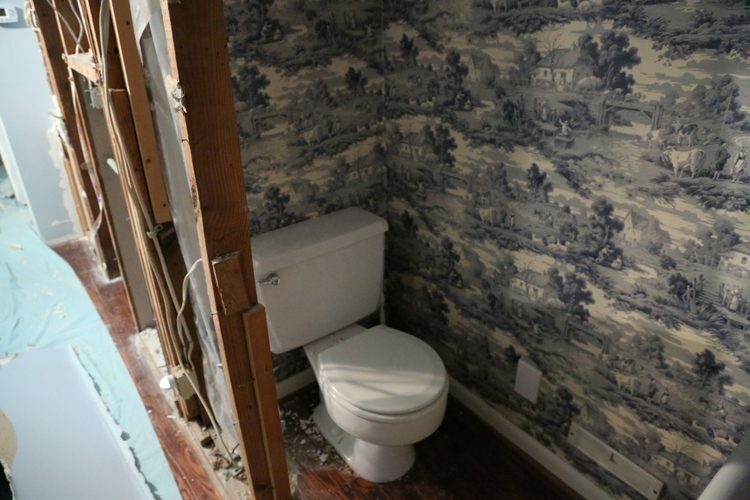 My Bathroom Remodel! This entry was posted in Color Consultation, Design Intervention, My Decorology and tagged bathroom, benjamin-moore-steamed-spinach, black-and-white-bathroom, black-windows, gold bathroom fixture, gold-faucet, marble-tile, remodel, small-bathroom, subway tile, tiny. IN LOVE!!! Love your style, friend! 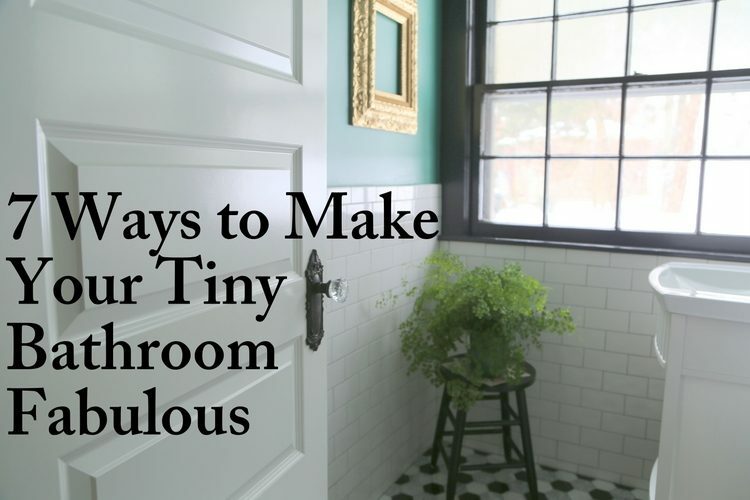 Gives me new inspiration to keep on trucking in our old house with tiny bathrooms. Well, tiny everything. Ha! I needed to see this so badly today. 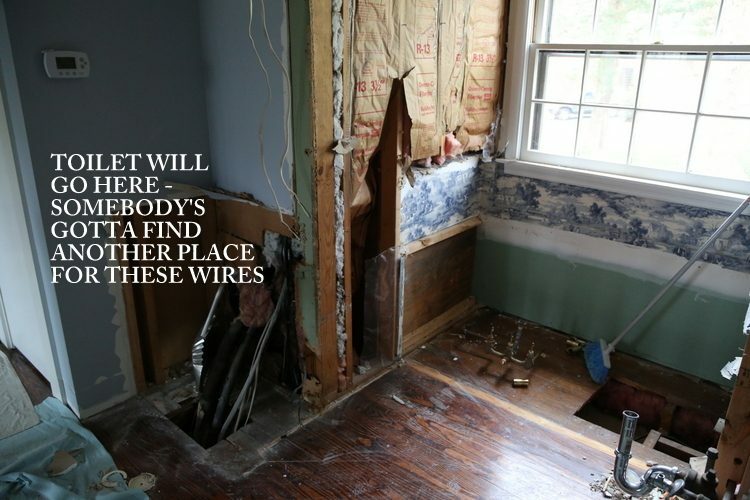 Sometimes a slow-going remodel. An be so so overwhelming. This bathroom is glorious! Thank you, Amanda! We started the first week of December, so the kids had to camp out in the basement for 10 weeks because of all the mess upstairs. It felt like forever, and there were many bumps in the road! But we are so happy with how everything is now – patience and persistence pays off! Gorgeous! So timeless and a great use of space. So jealous of your daughters! I’m a little jelly of them, too! 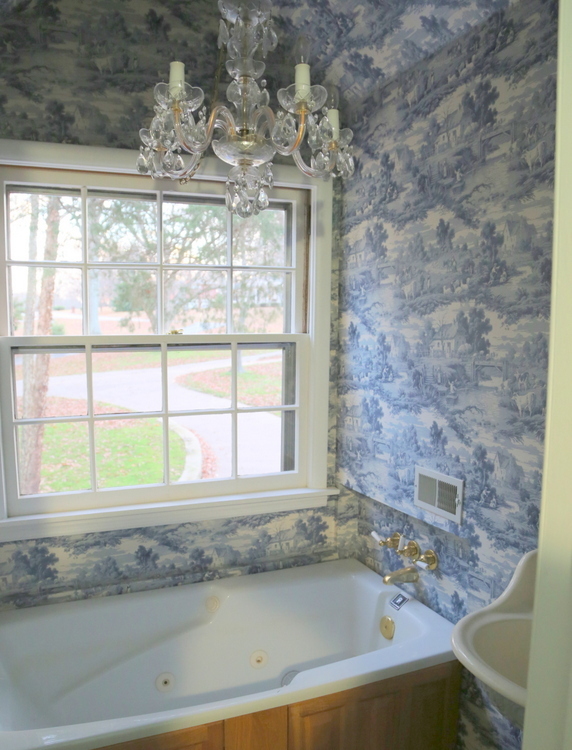 Our bathroom is not as fab as this one . . . I LOVE your new bathroom. I completely agree with hex tile on the floor. I’m not really loving those giant floor tiles in bathrooms. As usual you have created a stunning space! This is an absolutely stunning room. Bravo! Well done! It comes just in time as I am set to begin the transformation of my daughter’s tiny bathroom. Would you mind sharing the make/model of your sink faucet? It would be perfect in the space. The sink faucet is Newport Brass, but I can’t remember the name of the fixture specifically. You could use the photo as a guide? What a gorgeous bathroom!! Can you please tell me what finish you ordered from Newport Brass for the faucet? I’ve been having trouble finding their brass finishes in showrooms, but the set you picked is simply divine! It was special order – I can’t remember the name of the finish, but it looks like brushed brass. Wow…what a transformation! That black trim around the window is amazing. I so want to try this somewhere (but not in my rental 🙂 ) Also love the mix of high and low. Love that you splurged on that floor, and was able to still have a great look with the subway tile. Great job! This is fabulous!! I knew it would be. I love the way you laid out this post so I could get the plan and the befores and then dive in to the afters!!! Love the tile, the brass, the hardware!! Love, love. It is gorgeous, Kristie! 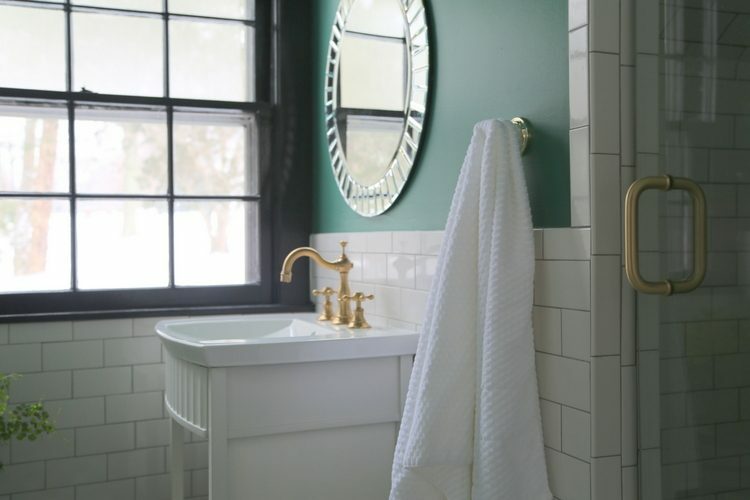 I’m especially fond of the gold fixtures and green walls, and they look great with the black and white. I also like the mirror–it reminds me of the ones you helped me hang in my bedroom. You have such a gift for design. 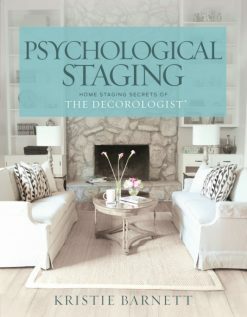 Hope your girls appreciate this fabulous space! A perfect example of how classic does not have to be boring! Love it! What an amazing and creative transformation! I love the gold finishes, black accents and beautiful colour. Well done girl! 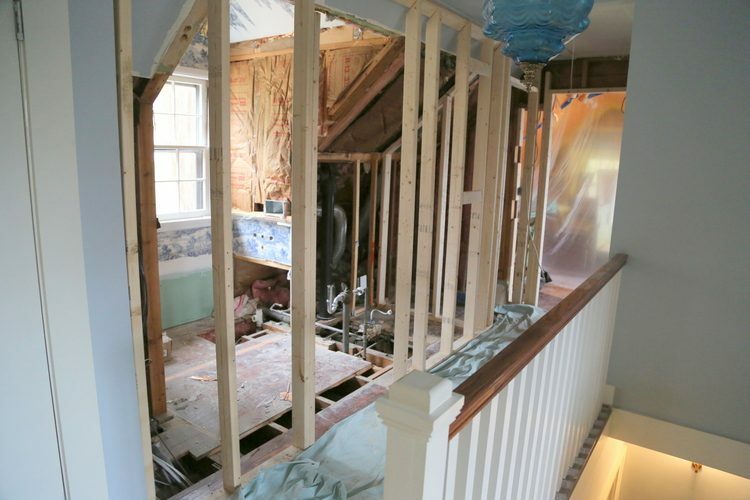 Renovation is such a huge challenge. But, looking at this gorgeous bathroom, it’s certainly worth it! 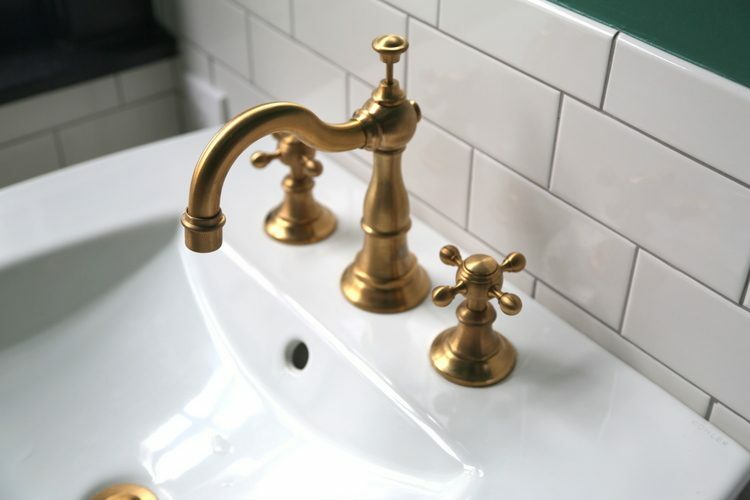 I’m just swooning over the brushed brass fixtures – how divine with that paint colour. 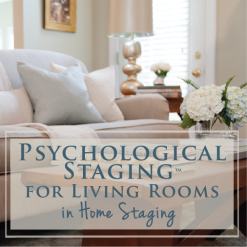 Such a wonderful addition to your beautiful home Kristie! Congratulations! What a huge difference that will make in your family’s daily life. And it’s beautiful, of course! Absolutely lovely. I bet your girls are so happy to have such a sweet spot to fluff and primp! By the way, where did you get your subway tiles for $.22? Love your style. 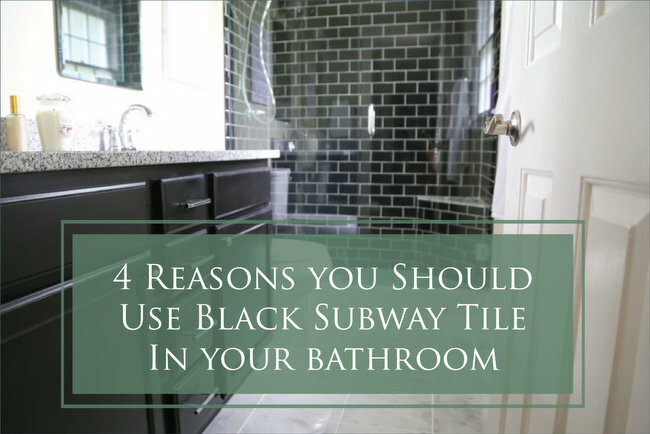 Thanks, Alyce – I got the subway tile for $.22 each at Lowes! AMAZING! I love the emerald green and gold combo. You did an excellent job, why wouldn’t you! Thank you so much for sharing! Thank you, Loroy! Sometimes it’s a good idea to start with the one thing most important to you and build the design around it. For you, it sounds like that was great deal of a countertop. 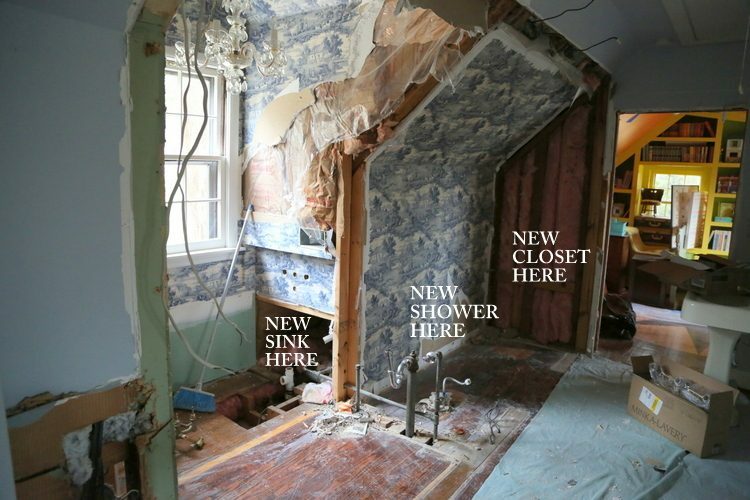 Good luck on your remodel, and let us know how it turns out! Love it! 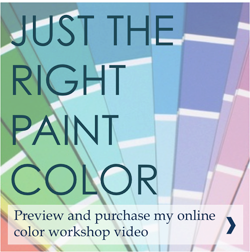 Love your paint color choices, floor, hooks, window, everything! Great job as usual my friend! 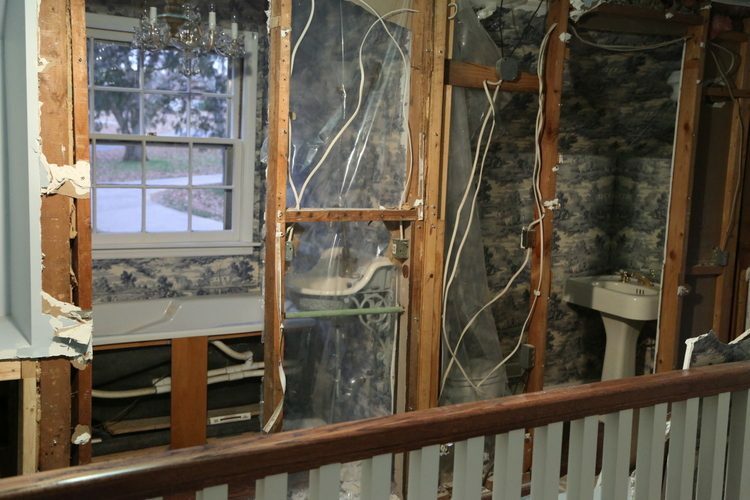 I’m curious about the tub – did you eliminate it in favor of a shower? I’m remodeling a couple years before resale and have an 80s master bath with a shower just big enough to stand up in. 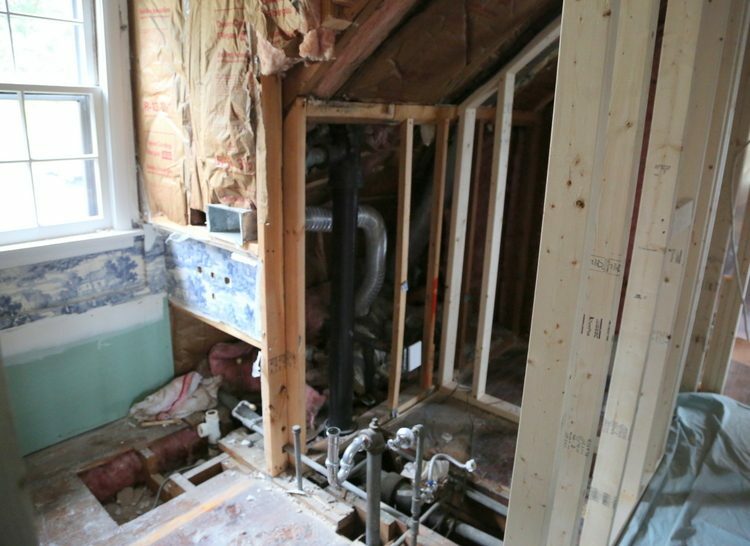 The hall bath has both tub and shower… Do you (and your readers) think it would be good for resale to replace the master’s tub with a large shower and using the old shower space to build a better storage area ? Well done and the green paint included on the ceiling is the icing on the cake!!! Thanks – yes, emerald green icing! Gorgeous!! We have a decent sized bathroom upstairs, but it’s longish/narrowish. I’m definitely painting the window at the long end black. Love that look! 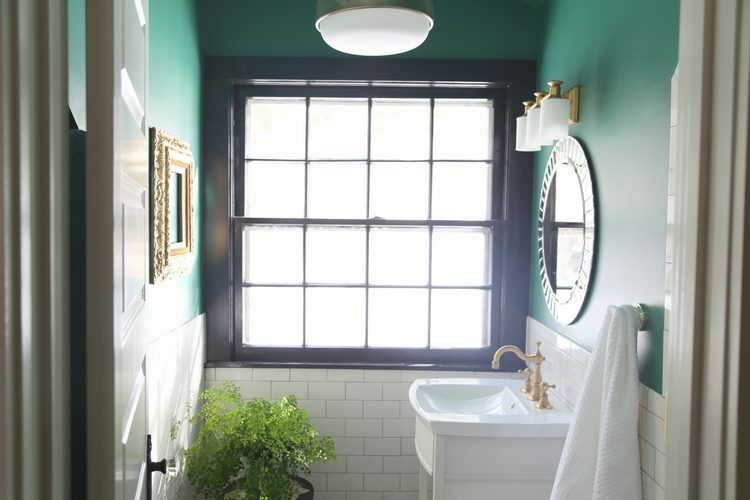 You will love it – I decided to do black on three more windows in the upstairs renovation (all in the same room) and I am thrilled with how it looks. It really pulls your eyes to the outdoors. 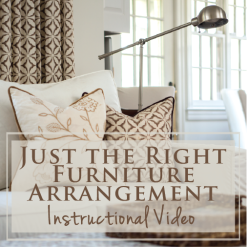 I think I may be passing on the chandelier to someone else now – it came from an old house my sister-in-law purchased as a rental years ago. I am keeping the sink – not quite sure what I’m going to do with it. Maybe mount it on a wall somewhere and use it as a planter??? Whoa!!! That is awesome! Your timing is perfect, Kristie! 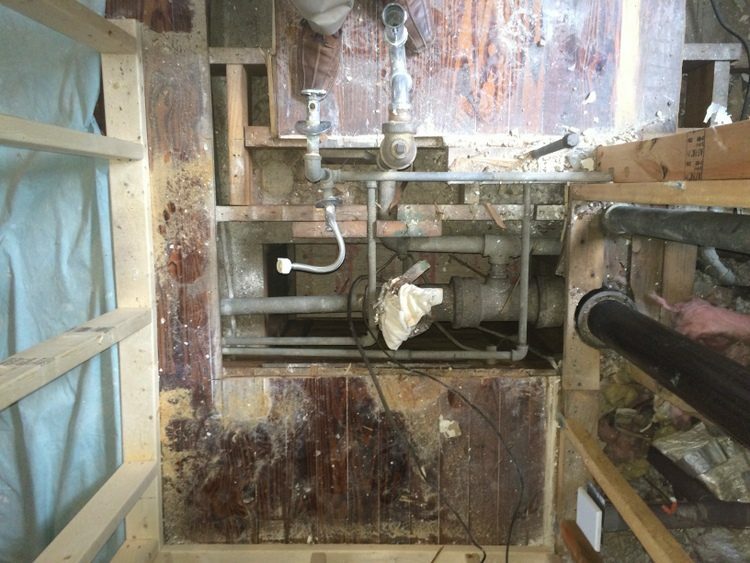 We are set to turn a small laundry room into a bathroom in the 1855 portion of our house. 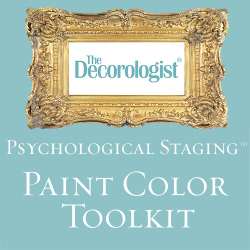 You have soooo many good tips in this post! You just saved us in at least a couple of ways! No big tile for us now–we had been advised to use larger tile to “expand the space visually”. What a disappointment that would have been. Thank you for your timely advice and inspiration!!! LOVE this, Kristie! 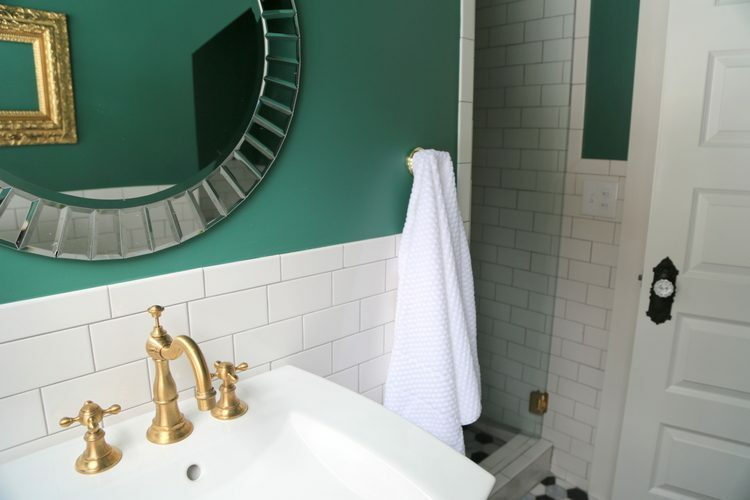 Amazing use of space and the tile is gorgeous, and that green —- beautiful! Hi Kristie. I love the hanging light fixture! Is it a period piece or wad it new! 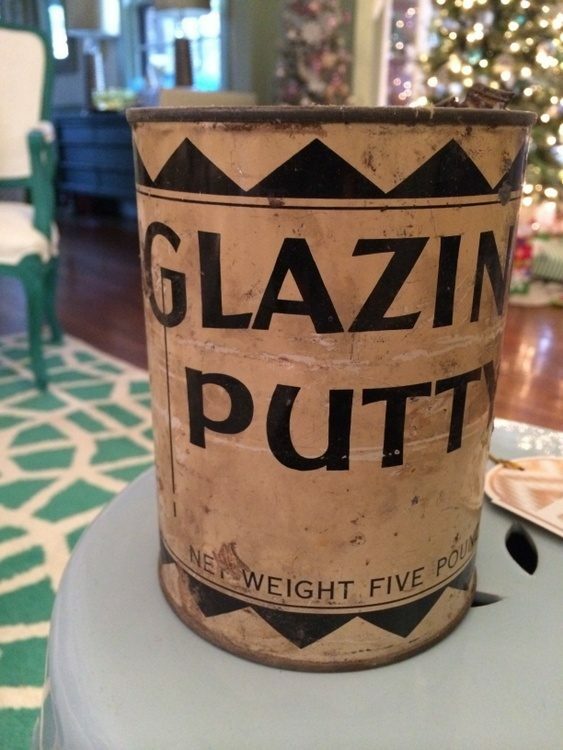 If new, do you remember the name/brand and where you purchased it? If not, no worries. Love the way this bath turned out! It’s new – Murray Feiss, from Ferguson’s in 100 Oaks area. I am a long time reader, first time commenter. 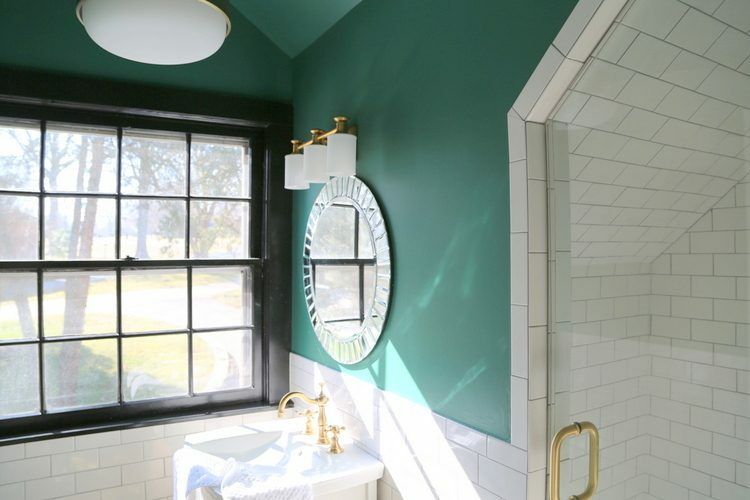 I am considering painting the window trim black in our 1940s Tudor upstair bathroom. The floor tile is original the the home and is similar to what you used. I was curious if you would share what black paint you used for the window?